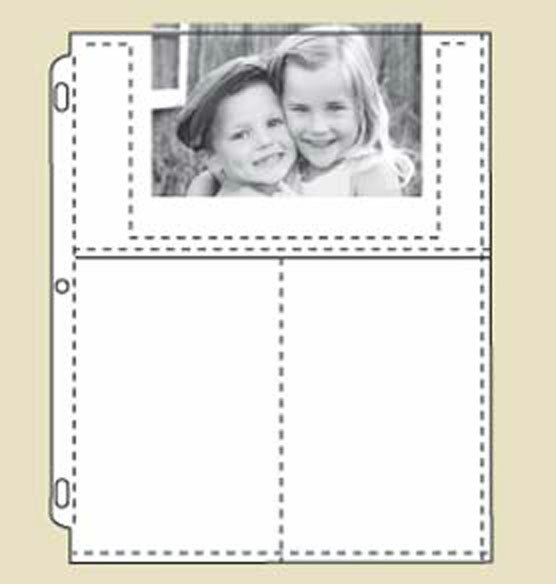 Want photo albums simplified? This Felicity 3-ring photo album set is it. Choose your color from 19 fabulous choices; add two lines of cover personalization and you’re done. 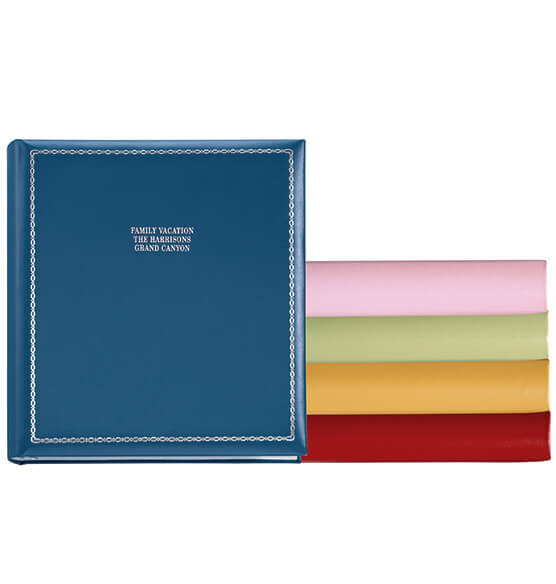 These leather bound photo albums sets contain two sets of our most popular 4" x 6" double weight photo pages, allowing you to showcase up to 120 photos. 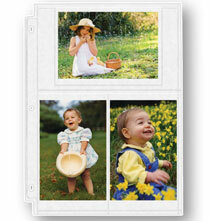 Your photo pages will be preserved and protected in our best selling 3-ring binder album. 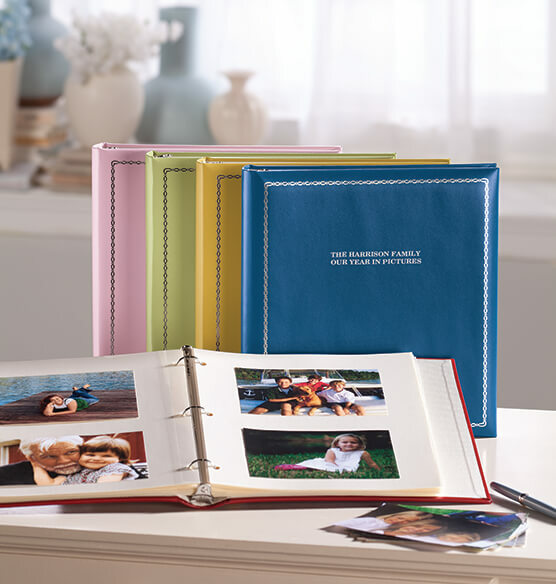 Crafted of European bonded leather with a classic silver border, this is one personalized photo album you will be proud to show off. The inside is lined with ivory moiré for the finishing touch. If the photos inside were not enough to make this album uniquely yours, we are including 2 lines of front cover personalization. 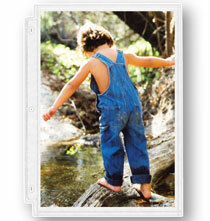 Your name or message will provide a preview of the special moments displayed inside. Bright Green is not available at this time. I have many of them; good quality. I like the variety of colors and I'm excited to see them displayed on my shelf- a different color for different years of our lives. Nice quality item at a reasonable price. I love these albums. 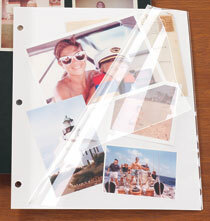 Very sturdy, nice colors, perfect for capturing a year in your life or a special trip, wedding etc. BEST ANSWER: Thank you for your question. The ring is 1 inch on this album. We hope this information will be of help to you. The rings on the one I have are about 1 1/4' diameter. why does this say it comes in 19 colors, but only 5 are shown? I bought this album a long time ago and have an orange and a purple. I am looking to add more colors. BEST ANSWER: Thank you for your question. 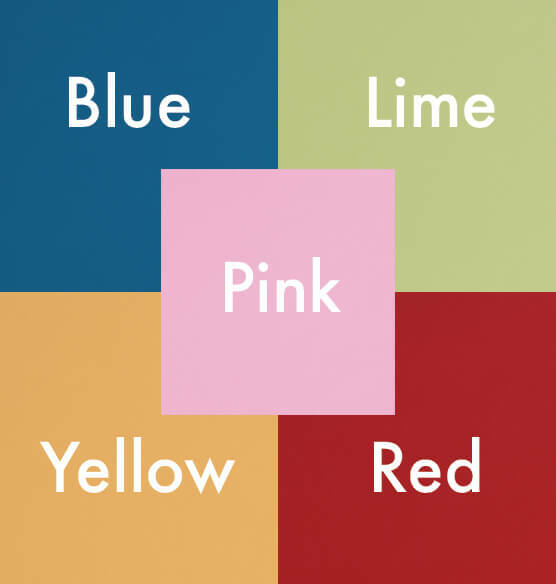 At this time only 5 colors are shown. Our vendor has discontinued many of the colors. We are hoping to have a few more colors in the future. We hope this information will be of help to you. I have the pink and blue and I think red. Which is lime and which is bright green? BEST ANSWER: The bright green is the one in the picture that is between blue and orange. I love these albums and wanted them in rainbow colors so bought the bright green to make the assortment pop. LOVE it! Lime (light green) is the one pictured up front. The bright green (kelly green) is in the stack in the back. I want the bright pool colored blue (on the top of the stack in the picture) - not the navy-ish...is that the color that is listed as available? BEST ANSWER: Thank you for your question. At this time the bright light blue is not available. We only have the navy blue. We hope this information will be of help to you. Why are not all of the colors showing when I am trying to pick them? BEST ANSWER: Thank you for your question. Unfortunately the some of the colors have sold out. Since we no longer have inventory and are not expecting further shipments from the supplier the colors were cancelled. We apologize for any inconvenience this has caused you. We hope this information will be of help to you. I have two of these albums. 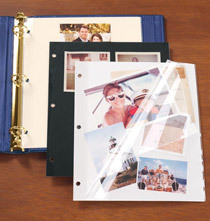 I do not need the 4x6 photo pages; rather, I need only the pages that only have covers over them so that I can insert photos, written words, letters, etc. What do I order for these type of pages? BEST ANSWER: Thank you for your question. You will need to order sheet protectors. We hope this information will be of help to you. Is the mint color available? Or will it be in the next few months? BEST ANSWER: Thank you for your question. Unfortunately, it has been discontinued. We hope this information will be of help to you. Can I get the pink with 8x10 pages? BEST ANSWER: Thank you for your question. You may order 8 X 10 photo pages separately. We hope this information will be of help to you. BEST ANSWER: Thank you for your question. The lavender is the light purple color. We hope this information will be of help to you. already began collecting albums in pink for my daughter. What do you recommend?